Goldfish.ie’s landing of IDG Direct as a client made today’s Irish Times. Double click to zoom and read the article in full. Wicklow firm Goldfish.ie has won a contract to provide telecoms technology to media and events company IDG Direct’s call centre in Dublin. 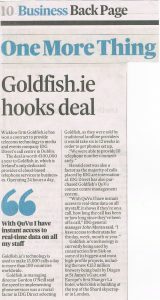 The deal is worth €100,000 per year to Goldfish.ie, which is Ireland’s only dedicated provider of cloud-based telephone services to businesses. Operating 24 hours a day, Goldfish.ie’s technology is used to make 15,000 calls a day to more than 100 countries worldwide. Goldfish.ie managing director Gordon O’Neill said the speed in implementing phone services was a crucial factor in IDG Direct selecting Goldfish, as they were told by traditional landline providers it would take 6 to 12 weeks in order to get phones set up. He said cost was also a factor as the majority of calls placed by IDG are international. IDG Direct has also purchased Goldfish’s QuVu contact centre management system. “With QuVu I have instant access to real-time data on all my staff; it shows if they’re on a call, how long the call has been or how long since they’ve been off a call. I have access to their stats for the day, week, month or year,” IDG general manager John Moran said. Goldfish.ie’s technology is currently being used by construction firm Sisk on some of its biggest and most high-profile projects, including the new €153 million brewery being built by Diageo at St James’s Gate, and Europe’s first Shangri-La hotel, which Sisk is building at the top of the Shard skyscraper in London.